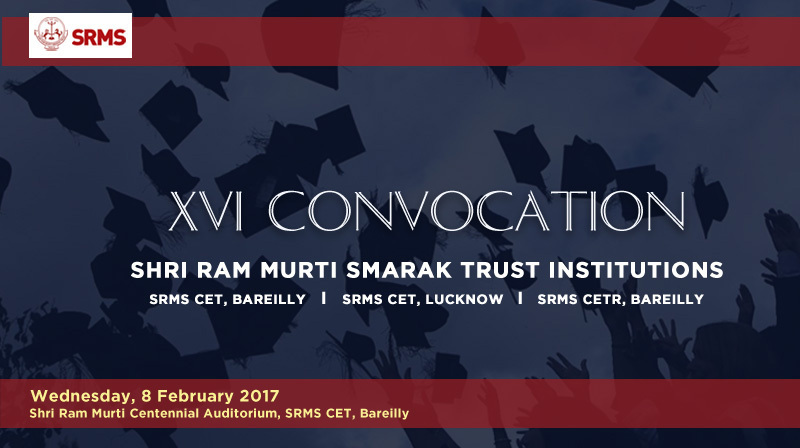 Various SRMS institutions will hold their convocation ceremony on February 8, 2017 at the Shri Ram Murti Centennial Auditorium at the campus of SRMS CET, Bareilly. February 8 holds a special significance for the Trust since it is the birth anniversary of the inspiring soul behind the Trust, Late Shri Ram Murti Ji. This will be the 16th Convocation of SRMS CET, Bareilly, 5th Convocation of SRMS CETR, Bareilly, and 2nd Convocation of SRMS CET, Lucknow. The Chief Guest for the event will be Shri Harash Malhotra, Vice President – Siemens Pvt. Ltd., Gurgaon. The ceremony will begin at 10:50 am with the assembly of dignitaries and other participants in the Robbing Tent. Once the procession reaches the venue, the proceedings will formally begin with lighting of the ceremonial lamp of learning by the Chief Guest followed by invocation of Saraswati Vandana, College Geet & University Kulgeet. The Welcome Address by the Chairman of SRMS Trust, presentation of the SRMS CET Annual Report by the Dean, Convocation Address by the Chief Guest, address by Hon’ble VC of Dr. A.P.J. Abdul Kalam Technical University (APJAKTU), Lucknow, will be followed by award of MBA, MCA, B.Pharm., and B.Tech degrees of the three institutions. After this, award of medals to the meritorious MBA, MCA, B.Tech, and B.Pharm. students will take place. In all 28 B.Tech, 4 B.Pharm., 3 MCA, and 4 MBA students will receive medal and cash awards depending on the level of their academic performance during their course. The ceremony is scheduled to end by 1:30pm with presentation of mementos to the dignitaries, vote of thanks, and a rendition of the National Anthem. Shri Ram Murti Smarak (SRMS) Trust, a public charitable Trust (Reg.) was established in the year 1990, to commemorate & Cherish memory of veteran freedom fighter, true Gandhian, ex-parliamentarian, ex-minister U.P., Late Ram Murti Ji.